In an interview with The Korean Times on February 25, Dr. Hyun Jin P. Moon urged the United States to work with allies, including South Korea, to focus on an endgame strategy for Korean reunification, not nuclear denuclearization, as the most viable solution to the crisis facing the peninsula. Read the full story on The Korea Times. The U.S. should push for policies with its allies, including South Korea, to seek an end goal of establishing a unified Korea, says a prominent NGO director. 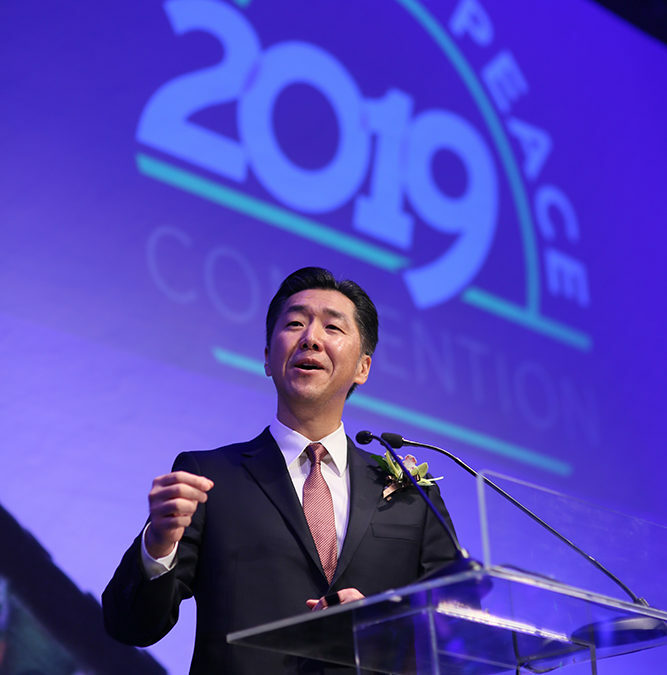 “It should be the responsibility of the global community to help the Korean people, bring a closure to this chapter of colonialism and the Cold War of the peninsula, allow us to develop, fulfill our destiny to create a model nation,” Global Peace Foundation (GPF) Chairman Moon Hyun-jin said in an interview with The Korea Times on Feb 25. Moon is an activist supporting unification through holding seminars and cultural events as well as volunteering for impoverished countries. He also wrote a vision book, “Korean Dream: A Vision for a Unified Korea,” to help others understand his philosophy to move toward unification. His father Moon Sun-myung was the founder of a religious movement known as the unification movement. Regarding the second summit between the U.S. and North Korea, he emphasized that the U.S. was missing the point because denuclearization was too narrow a focus, and unification should be an end goal in talking about the Korean Peninsula. He said his view was based on his expectation that North Korea was not going to give up its nuclear arsenal because it was the North’s only strength within the international community. He also anticipated that the summit in Hanoi between North Korean leader Kim Jong-un and U.S. President Donald Trump would have no results because the U.S and North Korea had different interests. “I don’t think the Korean people should expect anything big out of this. Nothing is going to happen because the U.S. is going to demand denuclearization; Kim is probably saying okay we will do it. But he is not going to do it,” he said. He said in commemorating the centennial of the May 1 Movement, a movement seeking independence from imperial Japan in 1919, people should recognize the importance of the Hongik Ingan philosophy, or living for the good of others, as the aspiration of the Korean people for 5,000 years and thus the key to build the foundation for Korean unification. He urged civic organizations and the population in general, especially the young generation, to take the lead in pushing for unification.